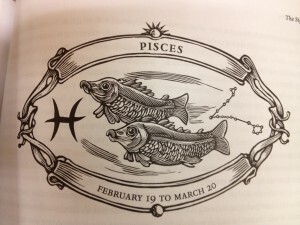 This month’s “Bodacious Business Horoscopes” entry highlights the most emotionally vacillating sun sign ever to swim against the tide: Pisces the (two) Fishes. These aquatic marathoners of the zodiac system ebb and flow from February 19 to March 20. When you need a sensitive soul to coax others toward their professional aspirations, count on Pisces to keep the dream afloat. Disclaimer: This post is a parody of Western astrology. By All Writes isn’t responsible for how employees and co-workers feel about your company’s ability to fulfill their emotional needs as a result of this profile about the Fishes on your payroll. Pisces is the Zodiac’s Mutable Water Sign–Here’s What It Means for Your Business: Pisces isn’t a member of the zodiac’s cardinal-sign club. However, it more than delivers as the sun sign most able to intuit other people’s feelings. Pisceans selflessly answer many a distress signal. Yes, Pisceans are caring business professionals, but their emotions swim up, down, and all around each workday. For Pisces, a Workplace to Call Home Offers Variety and Scope for the Imagination: Pisces is considered the zodiac’s twelfth and final house. As such, Pisceans are the astrological sum of all 11 previous zodiac signs. A combination of deep empathy and lack of cutthroat competitiveness means Pisceans prefer mid-level responsibilities, not the C-level suite and executive headaches. It wouldn’t surprise me to find out that Mother Teresa, Mahatma Gandhi, and Albert Einstein were all Fishes. Best gifts for your Pisces minnows and guppies include: a book of Henry Wadsworth Longfellow’s poetry, a Native American dream-catcher, one of those trendy adult coloring books, and a blank fold-out map or atlas. Compassionate Pisceans are Sensitive to Other Employees’ Sensitivities: Again, most Pisceans don’t chase the Top Gun position at work. They prefer a dreamlike work environment over the repetitive reality of making mundane business decisions. These gentle souls immerse themselves in the creative process. They’d rather not corral their ideas into a corporate box. Your Pisceans’ most positive traits: caring, trusting and helpful, creative, mystical/otherworldly, gentle and compassionate, understanding of people’s feelings/emotions. Accessing a Piscean’s Intuition Involves Navigating His/Her Bouts of Self-Pity: All zodiac signs have their negative traits, and Pisces is no exception. Never doubt a Piscean’s sincerity when supporting a workplace cause that prioritizes people over profit. But be advised: Pisces’s sensitivity to the business world’s “soulless” highs and lows is an emotional weight to carry. Eventually, Pisceans unleash their “woe is me” inner dialogue from the other side of dreamworld. Less-than-stellar attributes associated with your Fishes: self-pity, escapist behavior, losing a grasp on reality, becoming too emotionally involved with others’ problems/situations, sensitivity to criticism. A Career in the Arts or a Service-Related Profession Fulfills Fishes’ Dreams: Above all else, a Pisces values a career that allows him or her freedom of expression. That’s why this sun sign seeks a self-directed opportunity or position rather than the executive limelight. When Pisceans are part of a staff or team, they prefer assignments involving constant change (so they don’t get bored). I’m not saying you won’t find Pisces behind a desk via a corporate job. It’s just that Fishes would rather swim in creative pools of water: film, theater, television, radio, ballet, music, fashion, and art. Because they can’t walk away from people in distress, Pisceans also gravitate to charitable work and nursing. A Completely Speculative Business Interpretation of Pisces’s Astral Assets: Here’s something you don’t see every day–a business interpretation of a zodiac sign’s ruling planet, lucky day, lucky number(s), and primary colors. Do Pisces’s two Fishes rule your birthdate? If so, did this profile stimulate any fin-slapping from you upon the water’s surface regarding accuracy? What other interpretive traits would you add to this zodiac sign from a business perspective? For those of you with a birthday dwelling in another house, I’ve probably already reeled in your zodiac sign’s profile–hook, line, and sinker (i.e., a previous “Bodacious Business Horoscope”). Toward the end of March, I’ll tread lightly around the zodiac’s not-so-secret battering ram: Aries. 2 Responses to Bodacious Business Horoscopes: Perceptive Pisces! Think you got more than a few things right there, Lori. Had to share with my son. Thanks for sharing this with your Piscean son. I enjoyed your recent post about the birthday boy; he sounds a soulful sort. The expression on his face in the lead photo speaks to me!